Can you combine justice with forgiveness? In April 1996 an extraordinary process began in South Africa. The Truth and Reconciliation Commission, under its chairman Archbishop Desmond Tutu, held its first public hearings to investigate over thirty years of human rights violations under apartheid. The Commission had been founded in the belief that truth was the only means by which the people of South Africa could come to common understanding of their past, and that this understanding was necessary if the country was to forge a new national identity in the future. In the first two years more than 20,000 victims made statements to the commissioners and, encouraged by the possibility of amnesty, some 7,000 perpetrators came forward to confess their crimes. The TRC hearings took place in township halls, churches and civic centres all over South Africa. In many cases victims and perpetrators sat in the same room to give evidence. 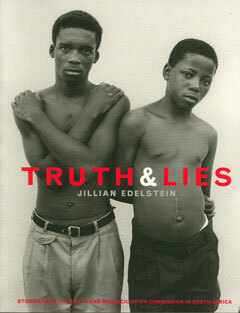 Jillian Edelstein spent four years travelling back and forth between London and South Africa attending hearings of the Truth and Reconciliation Commission up and down the country. She set up her camera in makeshift studios in rooms next door to where the hearings were held and visited people at home in the townships or deep in the countryside to take their portraits and listen to their stories. What she brought back was a collective portrait of a country which, between the Sixties and the Nineties, was engaged in a vicious struggle in which thousands of people were abducted, tortured, and killed. This book tells some of their stories. It is unique in that it puts faces to the personal testimonies of both victims and perpetrators. In the most direct way it documents one of the most important experiments in democratic justice attempted in the twentieth century.